Our state’s past is recorded not just in history books but also in documents created by the General Assembly, state agencies and more. These documents provide insights into what was happening in the state at the time, and what our government was doing. So as part of our celebration of the Illinois Bicentennial this year, here’s a taste of the enormous collection of Illinois documents we have at CPL. Chicago Public Library became an Illinois depository with the inception of the state depository program in 1968. However, we began collecting Illinois documents much earlier, so our resources date back to the early 1800s. 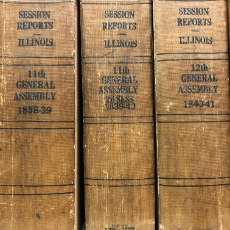 Historical and legislative documents are available in publications of the Illinois General Assembly, the Secretary of State and other state agencies, departments, institutions and boards. Recent Illinois documents are available online through Electronic Documents of Illinois. 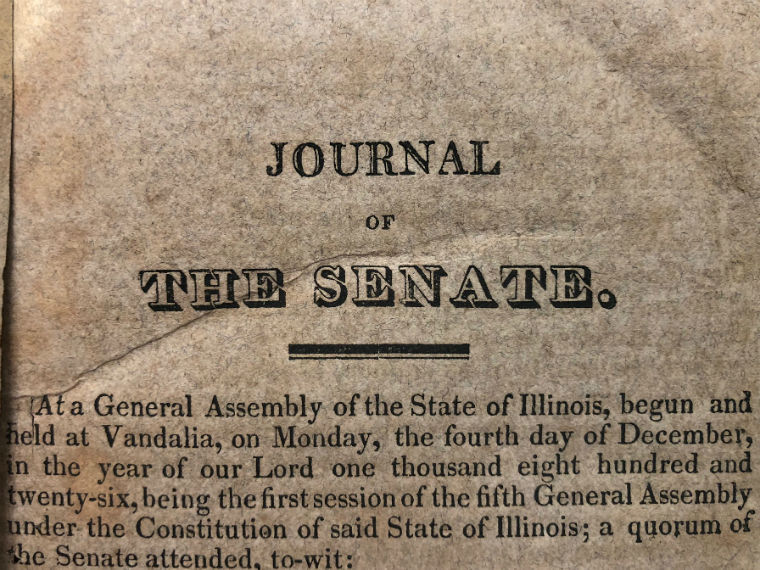 One of the oldest Illinois volumes in our collection is the 1826 Journal of the Senate of the General Assembly. In 1826, Vandalia was the state capital, and the General Assembly was already on its third state house (the first was in Kaskaskia, and the second through fourth houses were in Vandalia). You can visit the fourth iteration of the state house in Vandalia, but none of the previous buildings survive. The fifth and the sixth capitol buildings are in Springfield: The fifth is now the Old State Capitol, which was reconstructed in the 1960s, and the sixth is our current one. Early versions of state departments, agencies, boards, etc., made reports to the General Assembly that were compiled first in the Journal of the Senate and the Journal of the House of Representatives, and from 1838 to 1897 in the Session Reports, officially titled (in chronological order) the Reports Made to the Senate and House of Representatives of the State of Illinois, the Reports Made to the ... General Assembly of the State of Illinois, and the Reports to the General Assembly of Illinois at Its ... Regular Session. These reports are often no more than a dry accounting of how the agency spent its money and what rules or resolutions it passed, but sometimes you come across something different. One such example is a report from the Committee on the Penitentiary on "the causes of the frequent escapes of convicts from the penitentiary" (February 11, 1839). 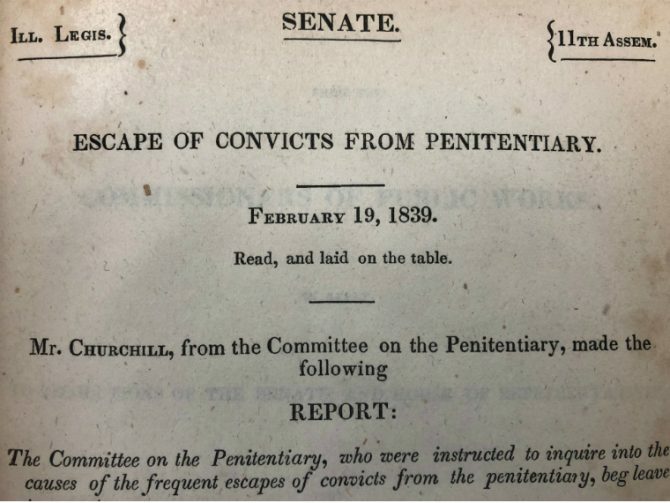 The report alleged that "some of the escapes which have taken place may be justly attributed to negligence on the part of the keepers, yet many of them were the result of the unfinished state of the building and the want of a right guard." Another one of our pre-Civil War Illinois books is the Journal of the Convention, Assembled at Springfield, June 7, 1847. The first Illinois Constitution had been approved in 1818 with the formation of the state, but by 1847 Illinois had grown so much in population that some amendments had to be made. Slavery was officially outlawed in Article XIII, Section 16: "There shall be neither slavery nor involuntary servitude in this state, except as a punishment for crime whereof the party shall have been duly convicted." However, only white male citizens over 21 had the right to vote (Article VI, Section 1). Did one of these catch your eye? Stop by Government Publications at Harold Washington Library Center to learn more about Illinois’ government.